Hyper assists its users to create a real clients database. The system checks every new lead and client and verifies that there are no exist duplicate cards in the system, by checking the phone number and the Email address. Duplicated Lead - These are contact details that have been received in the system or have been saved manually, and are similar to existing client card contact details. Fictive Contact - This is the status if an external engine provides wrong details or if the client was manually defined by the user as fictive or duplicated. The reason for this status will be written in the "Relationship Abstract" field. At the top of this table, use the search field to search for lead by Name / Phone / EMail / ID Number. Fill in this field and press the Search button. Alternatively, Use the Search Wizard to create and use customized filters. The Received Today button is used to search for the Fictive / Duplicated Leads of the current day. Standing on a Lead Record will display additional information about this record at the bottom of the screen. The user can edit or add information fields according to requirements and needs. 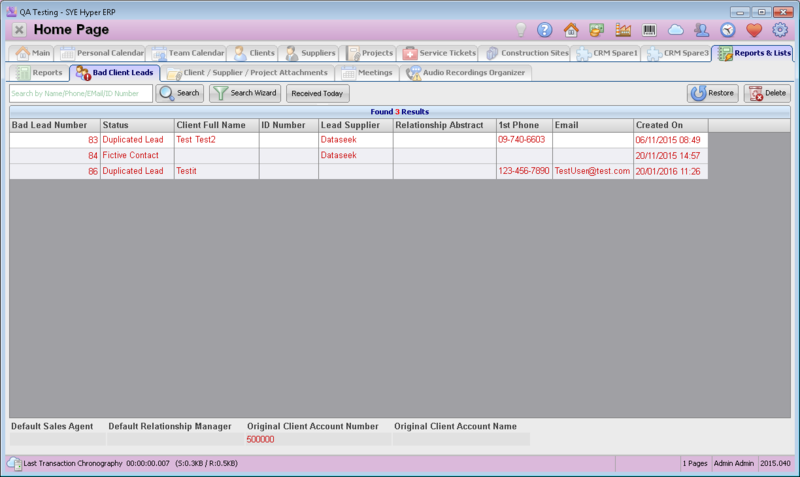 Double click on a lead record to open the client card. Please note - a duplicated client will also be displayed in the original client card, in the "Bad Client Leads" tab. In order to restore a bad lead and change its status to real lead, click on the bad lead record and press the Restore button. The user will need to confirm this action and change the bad lead status to New client. In order to delete a bad lead, choose its record and press the Delete button. This option is usually used for arranging the bad leads list. Restoration of a lead will create a new client card, with all of its details and information fields. If the user changes the status of a client card to Fictive / Duplicated, only the values of the information fields in the "hyp_Bad Client Leads" table will be saved. Therefore, if there are any additional necessary fields in the "hyp_Clients" table, make sure to define these fields in the "hyp_Bad Client Leads" table in advanced, during the installation process. Please note - any value of a field which was not defined in the "hyp_Bad Client Leads", will be deleted. Deleted leads will be moved to the deleted items list of the "hyp_Bad Client Leads" table.